Christmas, with all the shopping, cooking and hosting, sometimes leaves little space for making your home feel cosy and festive. But simple, quick and affordable ideas can have a big impact with little effort. 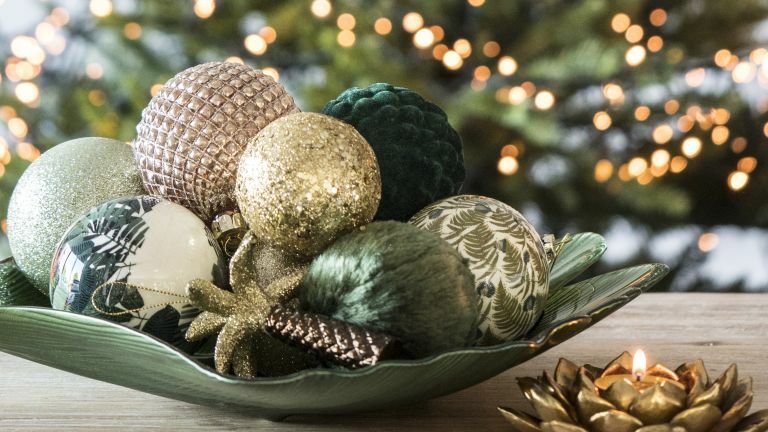 Follow these tips to make your home swiftly Christmas-ready. While we might all aspire to creating a brand new look for our Christmas decor every single year, in reality, it's much easier (and cheaper) to stick to one theme or colour scheme, whether it’s classic red, gold and green, or a more contemporary scheme of blue, silver and white. And, if you want to update your scheme year on year, the simple addition of one extra colour will have more impact. Find elegant tree decs and totally kitsch baubles that kids and adults alike will love in our buyer's guides. Think of your hall as the gateway to the festivities in your home, and decorate it cleverly to impress your guests. Wired garlands are ideal for winding along a banister as they don’t require taping (remember to leave spaces for hands to hold the rail). Quickest way to get the best look? Buy a plain wired garland and embellish with your own decorations, stylish touches and creative additions for an affordable go at personalisation. Choose a beautiful wreath for your front door to welcome friends and family and brighten up your neighbourhood – it'll give you a lift as you return home after a hard day's graft (or Christmas shopping), too. We've got some great (and affordable) ready-made Christmas wreaths to choose from. Suddenly got more time? Why not make your own wreath that will last beyond Christmas? On Christmas Eve and New Year's Eve, lighting the way along your garden path with lanterns or candles in votives for your guests to follow is easy but super-festive. Battery-operated tealights look just as good as the real thing, and are safer for your outdoor space, especially if you have young children or pets (or if you live in a flat and are lighting a hallway!). Or, light your garden with festoon lights or extra fairy lights, strung up into trees. We've got lots more clever ideas for displaying your fairy lights inventively, too. The Christmas tree is always going to be the living room's festive focal point, but what to do with a dining area? Instead of using your (existing) decorations around the entire room, go overboard with the table so that when guests arrive it looks fabulously festive. Keep your tablecloth and china neutral and build up colours and accessories as you go along. Scatter mini baubles, shimmering confetti or, if you have children, shiny wrapped chocolate coins in between the place settings, before introducing the bigger pieces such as candles and flowers. Admittedly, you'll have to unload it a bit to get the turkey on the table but the first-impression impact will be totally worth it – and you won't need to spend time or money to get a wow-factor look. Genius. If you are serving pre-dinner drinks, make special mocktails for the children and those who are driving home. Add a few drops of rosewater to cloudy pink lemonade or mix elderflower cordial with sparkling water, slices of lime and sprigs of mint for a refreshing treat. It's a small (and cheap) touch, but it'll put everyone (even the non-drinkers) in the right mood. Okay, so this is for the time-rich, but in most households, there's usually someone with nothing much to do in the run up to the big day (we're talking to you, teenagers, don't pretend you're wrapping up there in your room, we know you're watching YouTube). So, why not give them a job? You can go as simple or complicated as you like (writing names on extra present labels or baubles; creating dried fruit, herb and spice ensembles...); whatever you choose, it won't cost much but will make a big festive impact. We know for a fact that teens actually like cutting out paper snowflakes (tried and tested) but we also know that younger kids LOVE it (also tried and tested). So why not get them to make anything from bunting to snowflakes to gift labels to sprayed cones from festive wrapping paper, printer paper, waste paper... whatever you can find? Might keep them quiet for an hour, too. Your living room is the social hub of your home, but the Christmas tree will hog the limelight so this is what we'd do: if you have a fireplace, make it a focal point with festive greenery, stylish garlands and candles*. Otherwise, create festive groups (bowls of baubles, vases of greenery, shiny candle sconces) and dot them about the space. It's quick, easy and you've probably got most of these things in your home already. Make your own crackers and fill with personalised gifts, or get your children to draw little pictures or make up their own jokes. Keep any table flowers or decorations simple and low so as not to obstruct eye contact between guests. Everyone likes to feel useful, so ask guests to be involved by bringing in dishes and pouring drinks for a relaxed, informal meal. Fill glass bowls, bonbon jars and vases with colourful sweets, such as peppermint balls, marshmallows, shiny wrapped chocolates and candy canes, for an alternative centrepiece. Buy inexpensive baubles and write guests’ names on with glue pens and glitter for a personalised place setting and table gift. A row of herbs in pretty pots with festive ribbon is a stylish alternative to flowers on the table and the guests can take them home when they leave. Encourage guests to swap places between courses so that everyone has a chance to mingle (or argue, obviously, it IS Christmas). Make sure you have enough chairs in advance, so there’s no last-minute panic for dinner or your party. Prepare your vegetables on Christmas Eve and refrigerate them in cold water.